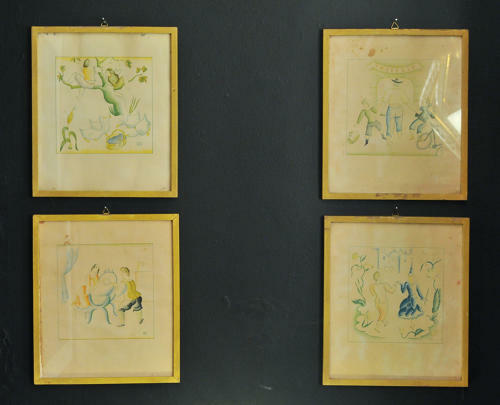 Four very rare water colour sketches by Giulio Rosso, Italy, 1936. Giulio Rosso was an Italian painter, decorator and illustrator. Born in Florence September the 5th 1897 died in Guaruja, SP (Brasil) May the 6th 1976. Giò Ponti about Giulio Rosso: "I like Rosso, he really amuses me and he is the Italian decorator with the sharpest inventions, adorned with the most imagination and more folding qualities and if I wanted to share thius guilt, I am, with Roberto Papini, Marcello Piacentini and Antonio Maraini, all Rosso lovers, in excellent company."